The 2009 flu pandemic was a global outbreak of a new strain of influenza virus, officially named the “Novel H1N1”, and commonly called “Swine Flu.” It is thought to be a mutation of four known strains of the influenza A virus, subtype H1N1,one endemic in (normally infecting) humans, one endemic in birds, and two endemic in pigs (swine). Experts assume that the Virus emerged from pigs in Asia, and was carried to North America by infected persons. Though the situation was controlled the panic and terror associated with the outbreak is difficult to wipe off. Swine influenza was first considered to be a disease related to human influenza during the 1918 Flu Pandemic, when pigs became sick at the same time as humans. The first identification of an influenza virus as a cause of disease in pigs occurred about ten years later, in 1930. Between 1997 and 2002, new strains of three different subtypes and five different genotypes have emerged. The H1N1 form of Swine Flu is one of the descendants of the strain that caused the 1918 Flu Pandemic. In September 1988, a swine flu virus killed one woman and infected others. 32-year old Barbara Ann Wieners was eight months pregnant when she and her husband became ill after visiting the hog barn at a county fair in Walworth County. Barbara died eight days later, after developing pneumonia. The only pathogen identified was an H1N1 strain of swine influenza virus. Doctors were able to induce labour and deliver a healthy daughter before she died. Additional studies suggested that some health care personnel who had contact with the patient developed mild influenza-like illnesses with antibody evidence of swine flu infection. However, there was no community outbreak. The new strain of H1N1 virus was first detected in people in the United States in April 2009. This virus is spreading from person-to-person worldwide, probably in much the same way that regular seasonal influenza viruses spread. On June 11, 2009, the World Health Organization (WHO) signalled that a pandemic of novel H1N1 flu was underway. Spread of novel H1N1 virus occurs in the same way that seasonal flu spreads. Flu viruses mainly spread from Person to Person through coughing or sneezing from people with infection. Sometimes people may become infected by touching an Infected Surface. This virus is transmitted between persons primarily through large-particle respiratory droplet transmission (e.g., when an infected person coughs or sneezes near a susceptible person). Transmission via these large-particle droplets requires close contact between source and recipient persons because droplets do not remain suspended in the air and generally travel only a short distance (< 6 feet). Centers for Disease Control and Prevention (CDC) of US had tabulated the symptomatology of H1N1 virus in human beings: Fever, (93%) Cough, (83%) Shortness of breath, (54%) fatigue/weakness, (40%) Chills, (37%) myalgias, (36%) rhinorrhea, (36%) sore throat, (31%) headache, (31%) vomiting, (29%) wheezing, (24%) diarrhoea (24%). The emergency features includes difficulty in respiration, changes in skin colour, disinclination towards fluids, severe or persistent vomiting, dullness or lethargy, irritability, pain or pressure in the chest or abdomen, sudden dizziness, severe or persistent vomiting with return of fever and increase in cough. High-risk groups for influenza complications include: children younger than 5 years of age; persons aged 65 years or older; children and adolescents (younger than 18 years) receiving long-term aspirin therapy; pregnant women; adults and children who have asthma or other chronic disorders, patients with metabolic disorders such as diabetes; adults and children who have immunosuppression (including immunosuppression caused by medications or by HIV); and residents of nursing homes and other chronic-care facilities. Persons in the ‘at risk group’ should not neglect any symptom as trivial as this may retard their health and wellbeing. A few simple guidelines can keep swine flu at abeyance. Washing hands frequently, getting enough sleep, drinking sufficient water, boosting one’s your immune system ,keeping informed ,knowing when to get help, avoiding alcohol , being physically active, keeping away from sick people and avoiding crowded areas. 2009 flu pandemic in India soon followed the outbreak of H1N1 virus in the United States and Mexico in March 2009. The first case of the flu in India was found on the Hyderabad airport on 13 May, when a man traveling from US to India was found H1N1 positive. Subsequently, more confirmed cases were reported and as the rate of transmission of the flu increased in the beginning of August, with the first death due to swine flu in India in Pune, panic began to spread. 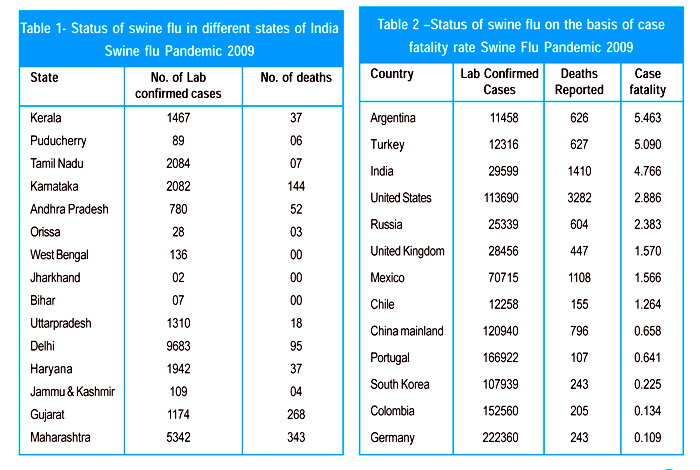 The spread of infection was not uniform as reflected in (Table 1).Eastern parts of India including North eastern states had the minimum number of laboratory positive cases or deaths during swine flu pandemic of 2009. However, Orissa which had 28 laboratory confirmed cases during Swine flu Pandemic 2009 presently has 87 laboratory confirmed cases (September 2010) with possibility of many more sub-clinical cases. Case fatality was very high in Argentina, Turkey and India. It is fairly high in developed countries like United States of America, Russia and United Kingdom while it is low in countries like China, South Korea and Germany despite of large number of laboratory confirmed cases. Swine flu - Natural disease or Bioterrorism? This flu virus, never before seen by scientists, has already proved fatal in different parts of the world. It was concluded that H1N1 possesses certain transmission “vectors” that suggest that the new flu strain has been genetically-manufactured as a military biological warfare weapon. The UN expert believes that Ebola, HIV/AIDS, and the current A-H1N1 swine flu virus are biological warfare agents. Homeopathy was very successful in dealing with the 1918-19 flu pandemic. The Journal of the American Institute for Homeopathy, May, 1921, had a long article about the use of homeopathy in the flu epidemic. Dr. T A McCann, from Dayton, Ohio, reported that 24,000 cases of flu treated allopathically had a mortality rate of 28.2% while 26,000 cases of flu treated homeopathically had a mortality rate of 1.05%. The most common remedy used was Gelsemium, with occasional cases needing Bryonia and Eupatorium. Dr. Herbert A. Roberts from Derby, CT, reported that 30 physicians in Connecticut responded to his request for data. Out of a total of 6,602 cases there were only 55 deaths, which was less than 1%. Dr. Roberts was working as a physician on a troop ship during WWI. He had 81 cases of flu on the way over to Europe. He reported, “All recovered and were landed. Every man received homeopathic treatment”. Time has changed and paved path to further discoveries and validated research in Homoeopathy and influenza like illness .There are more research publications on homeopathy for influenza than there are for most individual medical conditions. This brief overview summarises that literature, focusing in turn on reviews, randomised controlled trials (RCTs) and basic laboratory research. It concludes with comments about current homeopathy research developments in influenza and in the context of the A/H1N1 (swine flu) pandemic. Substantial original clinical research is reflected in a considerable number of published reviews, where influenza either was one of many conditions reviewed (e.g. Linde et al, 1997, 2001; Jonas et al, 2003; Mathie, 2003) or was the single focus of attention (Vickers & Smith, 2006; Guo et al, 2007). Each one of those reviews drew the conclusion that there is overall positive evidence for homeopathy in the treatment of influenza. Results have been described as “promising” (Linde et al, 2001) and “encouraging” (Guo et al, 2007). No review, however, has firmly concluded that homeopathy is clinically effective in this context. Both the latter reviews singled out the commercial homeopathic medicine Oscillococcinum, which itself has been the focus of a Cochrane systematic review (Vickers & Smith, 2006). The Cochrane review concluded that Oscillococcinum treatment reduced the length of influenza illness by 0.28 days (95% confidence interval, 0.50 to 0.06 days; P<0.05). However, it concluded: “though promising, the data were not strong enough to make a general recommendation to use Oscillococcinum for first-line treatment of influenza and influenza-like syndromes. Further research is warranted but the required sample sizes are large.” The authors also pointed out that “current evidence does not support a preventative effect of Oscillococcinum-like homeopathic medicines in influenza and influenza-like syndromes. Four RCTs of influenza prophylaxis have been published in the peer-review literature. Two were positive (Rottey et al, 1995; Brydak et al, 1999); two were statistically non-significant (Ferley et al, 1987; Attena et al, 1995). In addition, an RCT of a homeopathic formulation of influenza vaccine showed no effect on immunity to influenza, as measured by a standard serum antibody test (Lewith et al, 1989). The alarming prospect 4 years ago of an imminent H5N1 (avian) influenza pandemic resulted in the formation of the International Scientific Committee on Homeopathy and Influenza. The committee’s work includes: (1) initiating research programmes to evaluate the use of homeopathy in the prevention and treatment of influenza, including H5N1 and A/H1N1 influenza; (2) evaluating research proposals submitted to it and providing financial support for approved projects. All forms of study design are eligible for consideration, including RCTs, clinical outcome studies, surveys, and laboratory experiments. An international survey of primary care practitioners’ use of homeopathy in the management of patients with A/H1N1 influenza is currently underway. Laboratory research findings in virology and immunology have provided initial data that may contribute to an understanding of homeopathy’s mode of action at the cellular level. New research in the above areas is being actively encouraged internationally. · The Central Council for Research in Homoeopathy (CCRH) had convened a meeting of a group of experts chaired by Dr. Diwan Harishchand in August 2009, to suggest ways and means of prevention of flu like illness through Homoeopathy. The group had recommended that homoeopathic medicine Arsenicum album 30 could be taken as a prophylactic against flu like illness. One dose of the medicine was recommended to be taken once daily for three days and repeated after one month following the same schedule if influenza like illness prevails in the same area. · In Pune, where the first case of death from H1N1 infection was reported, a research study was carried out by the Research Centre of D.S. Homoeopathic Medical College, Pune to find out the preventive role of homoeopathic medicines in H1N1 infection. A team of experts studied 41 diagnosed and hospitalized cases of H1N1 infection and concluded that Arsenicum album was the Genus epidemicus for the swine flu pandemic and can play an important role in prophylaxis of the same. · In another study, by analysis of symptoms of hospitalized patients, Dr. Anil Singhal MD (Hom. ), visiting faculty of Homoeopathic Medical Colleges of New Delhi suggested Arsenicum album in 30C potency as the drug of choice for prevention of flu like illness. His recommendation was based on repertorial analysis of some hospitalized patients. In an animal model study it was revealed that low dose of Arsenic exposure in drinking water (100 ppb) caused alteration in the immune system of the mice and made it more susceptible / vulnerable to severe H1N1 infection. In another animal model experiment, the induced Arsenic toxicity symptom was ameliorated by ultra high dilution of homoeopathic preparation of Arsenicum album in 200C potency. The results of these two animal model experiment support the similia principle i.e. ‘Like cures like’ thereby supporting the use of homoeopathic medicines in the treatment of H1N1 infections. Homoeopathy has an important role to play in both the curative and Prophylactic aspect of Influenza like illness.